Black Diamond PosiWire Quickpack. With six versatile PosiWire draws in one convenient pack, the PosiWire Quickpack is ready for any climbing adventure. 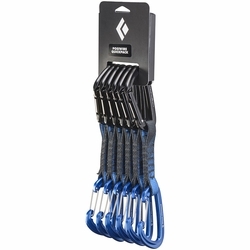 The Black Diamond PosiWire Quickpack gives you six of BD's PosiWire quickdraws that combine the smooth clipping and cleaning of the Positron carabiner with the light weight and multi-purpose function of our original HotWire carabiner.